Anyhow, I didn’t have any silver polish, and I wanted my shiny necklace back. So I thought I’d give this idea a try—I’d read a lot of different recipes, using things like salt, vinegar, and baking soda, but always aluminum foil and boiling water. I figured I’d give it a go with aluminum foil, boiling water, and baking soda, since baking soda has never done me wrong. So, I lined a small bowl with a scrap of leftover aluminum foil, shiny(er) side up. I sprinkled in some baking soda (maybe 2 tsp), and poured in some boiling water from the kettle. 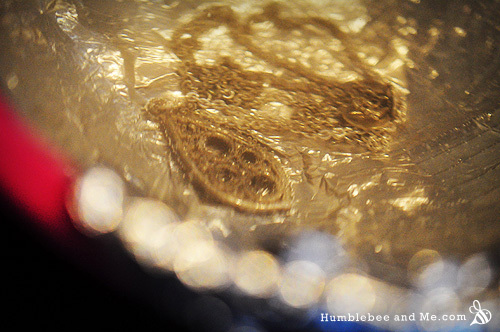 After stirring everything with a wee spoon to dissolve the baking soda, I tossed in my necklace and watched. 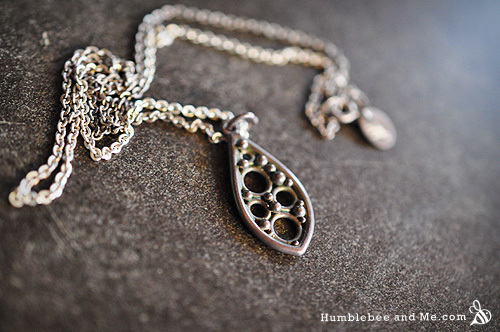 Check out the tip of the pendant! So shiny! And you know what? It worked (partially)! 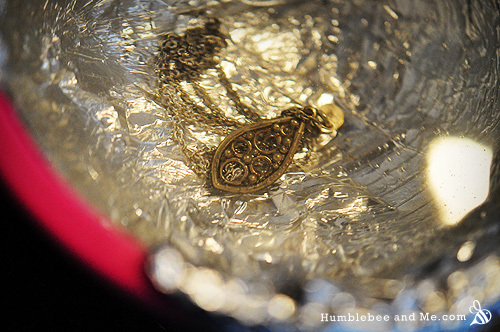 I could actually see the tarnish fading away, which is pretty darn cool if you ask me. But it wasn’t totally tarnish free, so afterwards I had to polish it up with a microfibre cloth and then repeat the soak & polish to really bling it up. That was cool, but a few months later my silver plated cutlery was looking pretty blah (eggs + silver = brown). I wanted a quick polish, but I didn’t want to have to polish every piece with a cloth and potentially re-soak. So I experimented by tossing a bit of washing soda (a new cleaning love of mine) into the mixture, and the results were fantastic! Every piece of silver bounced back to its glowing, silvery self in mere moments, no cloth polishing & re-soaking required. Bam. Success. Line the bowl with the aluminum foil. Sprinkle in the baking & washing soda, and pour the boiling water over top. 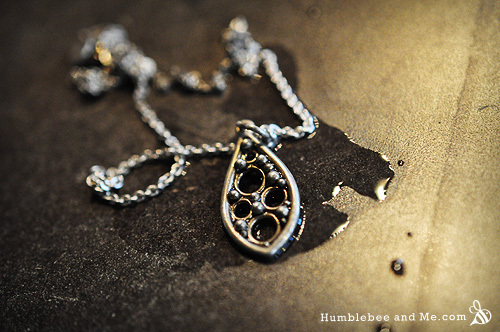 Quickly stir to dissolve, and then drop in your silver. Let is soak for five minutes or so, turning a few times. 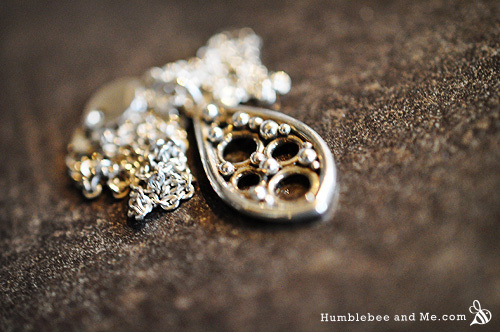 Once you can see a noticeable difference, pull out your beautiful, shiny silver and admire your (lack of) effort. Here is a link to make your own washing soda. Not one store in my area carries it. Easy to do, as well! Thank you for all your tips and recipes! I love this tip—thanks for sharing, Claudia! I am new to your site and find it very useful and engaging. I was wondering, what’s washing soda? Hi Lisa! Thanks for reading 🙂 Washing soda is like baking soda’s bigger, stronger cousin. It’s sodium carbonate instead of sodium bicarbonate. It has lots of awesome uses including water softening, descaling, and laundry detergent—and, of course, silver polishing 🙂 You can get it in the laundry detergent section of your local grocery store. I found mine at Superstore, about $10/5kg. I would like to try the jewelry polish recipe but I have no clue what washing soda is. Where can I find this? Does it just say “washing soda”? Thank you! You can find washing soda in the laundry detergent at the grocery store ! And it is surprisingly heavy 😛 And awesome! What about the gems in your silver jewelry? Will this mixture harm them? I have a silver ring with a stone that my mom gave me years ago and it needs a cleaning. Thanks! I’m afraid I can’t say as I mostly use this method with silver plated cutlery, and use silver polish for smaller, more delicate things that include stones. That’s more a function of it being easier to use a wee bit of polish on an old toothbrush to do one small piece rather than boil water, find the soda, etc., not because I’ve noticed any damage to the jewellery. What ingredients should I purchase when getting started?